Sitting comfortably at the heart of a thriving young folk performer scene is a singer-songwriter from Barrow-in- Furness by the name of Maz O’Connor. 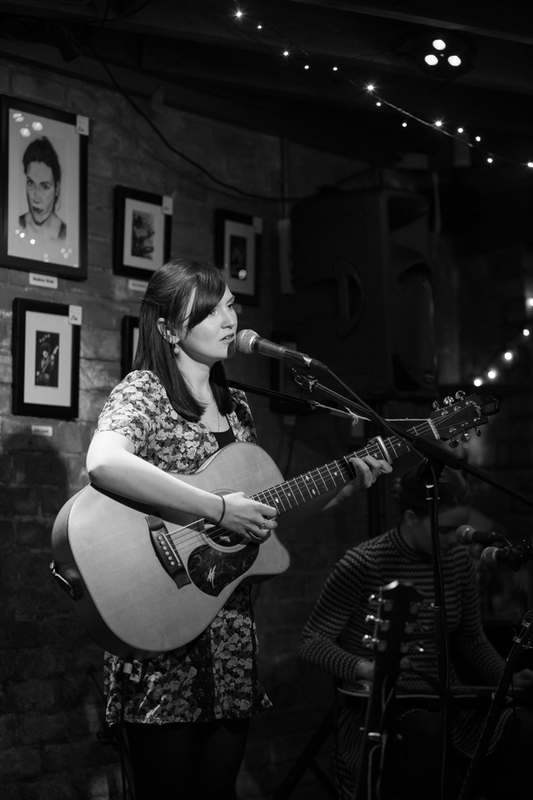 With a couple of albums under her belt, a BBC Radio 2 Folk award nomination in her bio and association with the English Folk Dance and Song Society (EFDSS), Maz is set to make 2016 another memorable year in her developing career. Among countless shows, a new record is set to emerge and by the numbers turning up at the Kitchen Garden Café tonight, word of her talent is spreading around. It was a return visit to the Kings Heath venue for Maz, although this time booked direct rather than through an external promoter, and the securing of her talents for the evening paid off handsomely. This current tour is being promoted under the banner of the new album title THE LONGING KIND and sensibly Maz is using the dates to showcase many songs from a release which sees her for the first time solely rely on original material. To help Maz deliver the songs to a live audience, she has enlisted the services of two other musicians to form a trio. One of these is no stranger to me or the venue as Laura Carrivick has played here several times with her sister Charlotte including most recently as a part of the new quartet Cardboard Fox. Tonight Laura provided a small element of twang to the sound, experimenting in lap steel and banjo alongside her trademark fiddle, a staple of any Carrivick Sisters show. In-demand session double bassist John Parker completed the trio and just looking at the artists he has played with suggested the rhythm part of the show was in good hands. Prior to Maz commencing the first of her two sets, London based fellow singer-songwriter Emma Ballantine opened the evening by playing some of her songs for half an hour. Emma had sufficiently impressed when supporting Blue Rose Code at the venue towards the end of last year to be invited back and her stylish take on simple song delivery created a setting for folks to sit up and take notice. Introducing songs from her recent EP titled TOURIST, which includes a cover of Suzanne Vega’s ‘The Queen and the Soldier’, Emma showed enough poise to rise above the deluge of solo acoustic acts and demonstrate that a promising future is in her grasp with more shows and recorded material under her belt. 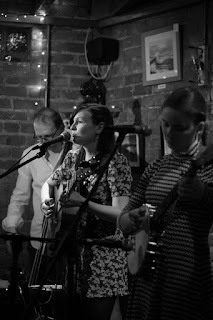 Perhaps getting to the status of Maz is a short term goal for Emma and what we witnessed as the main part of the show got underway was an assured folk singer balancing the key components of fine vocal acumen and engaging audience chat. The latter exuded a huge degree of warmth and familiarity as we got to know a little more about her and the influences for the new record. Opening with the title ‘The Longing Kind’, Maz almost devoted the whole of the first set to the new record by playing ‘A Winter's Blues’, ‘Crook of His Arm’. ‘Mother Make My Bed’ and ‘Jane Grey’. If you nip over to her Bandcamp site, three of the new songs can be streamed ahead of the release and while you’re there, pre-ordering wouldn’t be a bad idea. 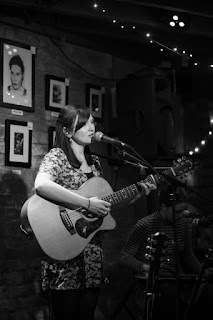 The exception of new songs before the interval was Maz’s take on the Child ballad ‘The Grey Selkie’ which appeared on one of her previous records. There were enough folk fans in the audience to respond in the affirmative when asked if anyone knew the story of the song. After being flanked by her bandmates for the entirety of the first set, Maz both started and finished the second in total solo mode, with the encore definitely saving the best to last and a stunning instrument-free rendition of ‘The Unquiet Grave’. Both bold and beautiful in its accomplishment, it sealed the success of the night. The new tracks still flowed after the break highlighted by a sad song melody which closes the album in ‘A Rose’ and ‘When the Whisky Runs Dry’. In this part of the show Maz did delve back into her 2014 album THIS WILLOWED LIGHT and turn to the songs ‘Nightcap’, ‘Barcelona’ and ‘The Mississippi Woman’. These tracks induced moments of invited audience participation, alternative takes on the creation story and a poignant comment of recalling a primary school pupil describing a folk singer as ‘somebody who writes songs but is not famous’. On that thoughtful and perceptive note, it is worth celebrating the fact that singers like Maz O’Connor are famous enough to uproot from their hometown and are prepared to tour their songs and music around the land. At just twenty five years of age, Maz has many years ahead of her in the often choppy waters of the music industry, but is supremely armed with a talent arsenal to ensure success on a defined scale is secured. Venues like the Kitchen Garden Café vibrantly play their part in this scene and on the evidence of tonight’s show, we may be in the midst of a golden age where indie is king and creativity is flowing unhindered.